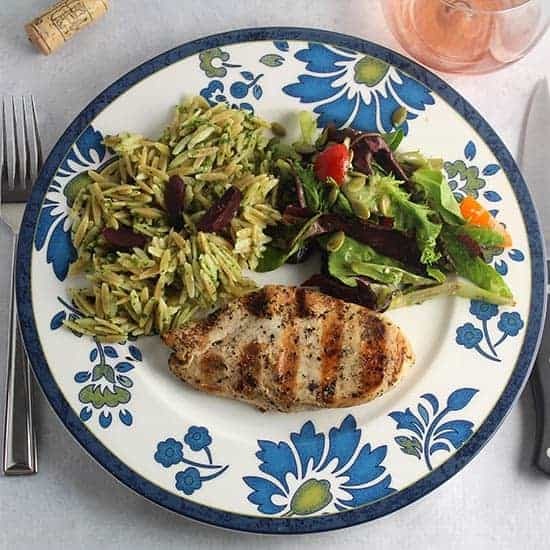 An easy and tasty Mediterranean Grilled Chicken recipe is even better when paired with a Bandol rosé wine! This Mediterranean Grilled Chicken recipe definitely started with the wine. I sampled a bit of the current vintage of the Domaine Suffrene Bandol Rosé and it seemed to me the perfect expression of a good rosé. Ripe melon flavors that just say summer in a glass. I grabbed a bottle without a specific food plan for it. But then I realized we had the rosé themed Wine Pairing Weekend coming up, hosted by Lori at Draecana Wines. So what food to pair with a Bandol rosé? The Bandol appellation in Provence features steep hillsides sloping to the sea. Seafood is certainly one natural food to pair with a Bandol rosé. But grilled chicken was another suggestion I came across, so I decided to go in that direction. When making Grilled Chicken Broccoli and Garlic Penne recently, I made a simple marinade for the chicken for the chicken that added a nice flavor. I decided to repurpose that blend of basil, garlic and olive oil for this easy Mediterranean Grilled Chicken. 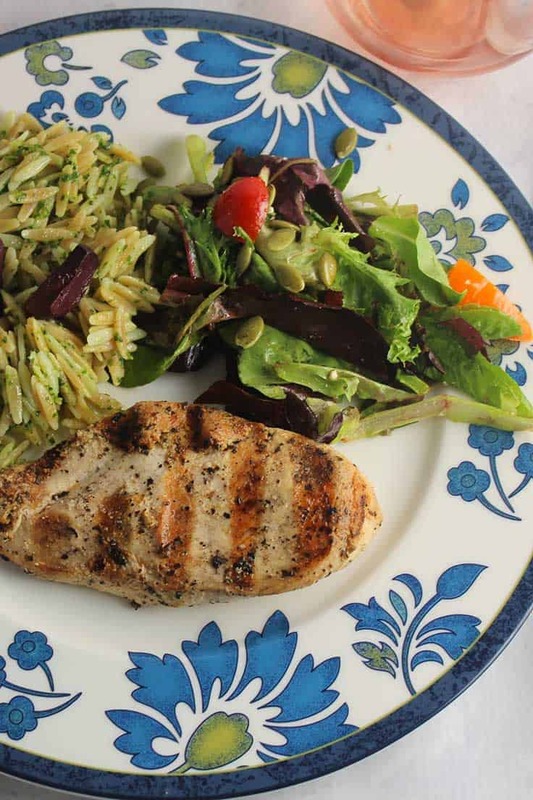 We even got a thumbs up from our discerning twelve year old, so I would say this grilled chicken recipe is a keeper! Domaine La Suffrene, located on a high hilltop in the Bandol appellation of Provence, started making their own wines in 1966. Previously they had sold their grapes to cooperatives. The vineyard features 70 year old Cinsault and 50 year old Mourvedre vines. 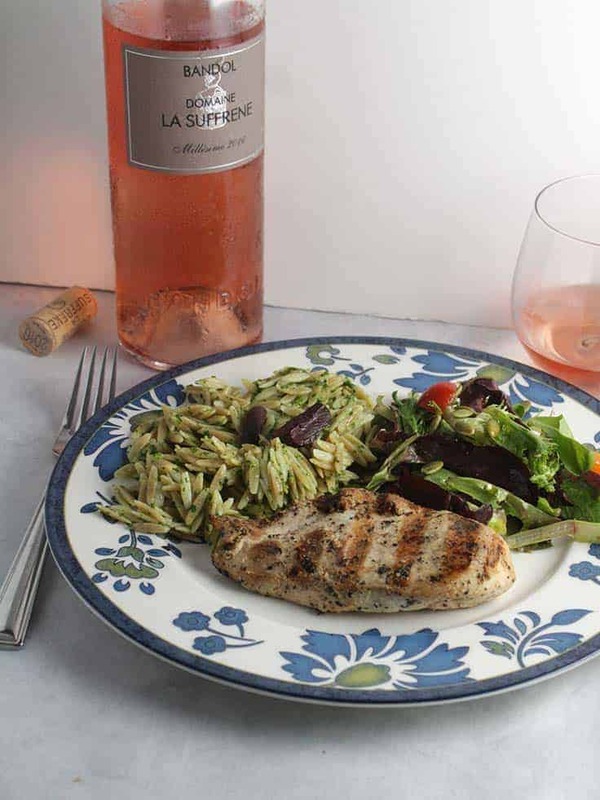 The 2016 Domaine La Suffrence Rosé ($25, 13.5% ABV) is a blend of Mourvedre, Cinsault, Grenache and Carignan. Taste of melon fruit and some underlying minerality. Definitely one of my favorite rosés, and as expected, this wine was a great pairing for our Mediterranean Grilled Chicken! A simple marinade with Mediterranean herbs make for a juicy, flavorful grilled chicken recipe. Combine the chicken in a bowl with the olive oil, garlic powder, basil and salt. Let it marinate for about 10 minutes at room temperature. Grill the chicken for about 6 minutes on one side, then turn over to finish grilling for another 6 minutes or so. Check the chicken for doneness after 12 minutes of total grilling. Remove chicken if done, or grill for a few more minutes to finish cooking if needed. Plate the chicken and enjoy. Lauren of The Swirling Dervish declares it is Dinner Time and Wine: Three Pairings for Sparkling Rosé. Lori of Dracaena Wines will be pairing Rosé and Thai Grilled Pizza. Join us for a live Twitter chat about rosé pairings on Saturday, August 12, at 11 am ET / 8 am PT. Check out past and upcoming #winePW events here. I love simple clean meals during the hot summer nights. This plate and pour look perfect to me. Thanks Wendy! Yes, this is a nice simple one. such a nice simple recipe and sounds absolutely delicious! Sounds like a lovely pairing and your Mediterranean grilled chicken is going in my “to try” file! Thanks Ellen, hope you like it! This pairing looks like a sure-thing! I’m also thinking a second night meal as a salad with leftovers would be fun. Leftover wine from Bandol? Maybe not! None leftover! There would definitely need to be 2 bottles to have the salad pairing the next day! Ooh! I do love a good Bandol rosé! This one sounds sublime and perfect for summer sipping. Your food pairing looks amazing, too. Thanks for sharing, David. Can’t go wrong with Bandol. This pairing is the epitome of summertime! Love your food and wine pairing David! One of the things I adore about rose is its diversity and Bandol offers a bit more ‘weight” for more substantial dishes! Cheers!